We were heading off to Blossom's place for morning tea on Sunday and I had promised to bring our spare French Press as we never use it and Blossom will. I retrieved the long unused glass coffee plunger from atop the kitchen cupboard, gave it a good scrub, and left it to dry while I went to work sewing a simple padded wrapper. While scanning my fabric shelves for a print that would lift the blue trim of the French Press it was this one which caught my eye and couldn't be ignored. There was no time to add a stitchery and in hindsight that was great because I was able to focus on the simplicity of this pretty gift/project, something I too often forget. There's still a good metre or more of the fabric left so I may trim some tea towels for Bloss or make a matching tea cosy - having the pretty theme run through her kitchen would be lovely. Our own French Press is in need of a wrapper too so this week it will receive a dress all it's own. I've got a neat idea that needs a little tweaking but if it works I'll share a tutorial with you. What's something simple you have made recently for the kitchen or table? Sharing your ideas might help others (and me!) to follow your lead. Have a lovely day, won't you?! Oh Jenny! I love the fabric and the cover turned out lovely....I agree, although your stitchery is to die for, the simplicity is just the ticket! Have a happy week dear lady! I love that fabric too. The colors are not right for my kitchen but I definitely know why you picked it up at the store. Really cheery! Not long ago, I strip pieced some green/brown/chicken fabric to the top of a worn looking dish drainer mat. I smile every time I stack dishes on it. Pretty weird, huh? How cute is that! Clever idea. Sometimes impulse buying can be good especially if it is something that makes you smile. It is rather lovely when you stash it away and rediscover it. That is simply beautiful!!! 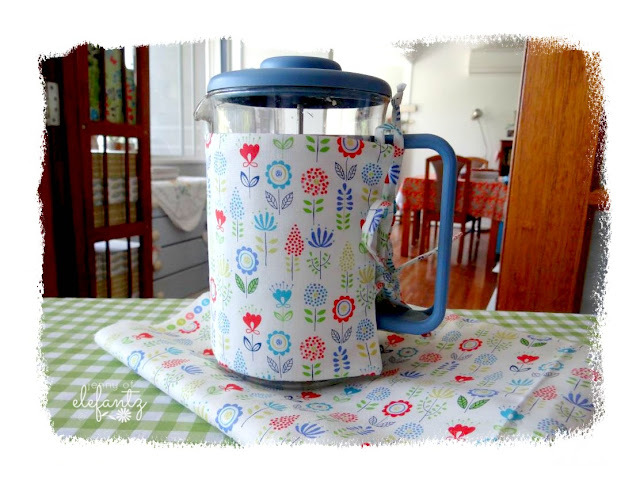 I hope you do make a tutorial - my French Press needs a dress too, lol!! You have given that plunger a new lease of life.........looks so sweet! Oh how pretty! Love the colors with the blue! Good Morning Jenny! 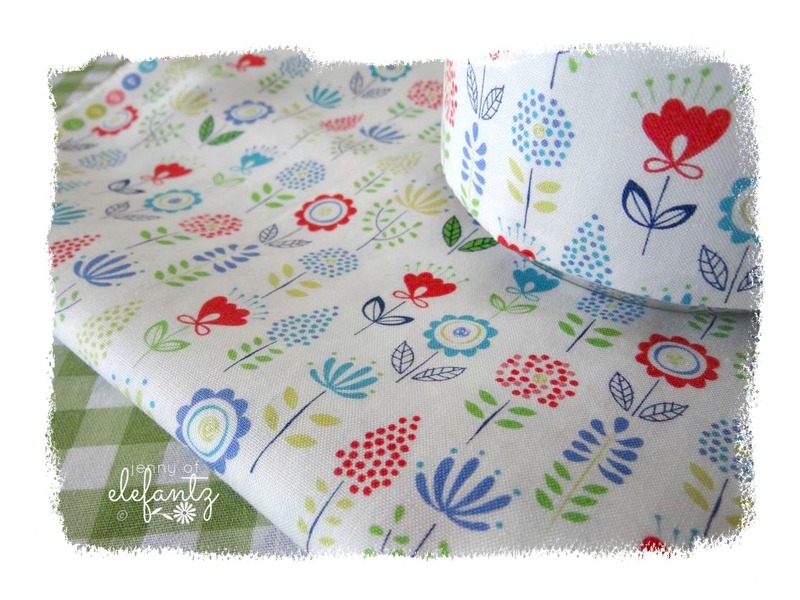 Your idea for the adorable cheery fabric was great! I have not made anything lately except pieces for the Double Wedding Ring Quilt that I am putting together for a very dear family friend. 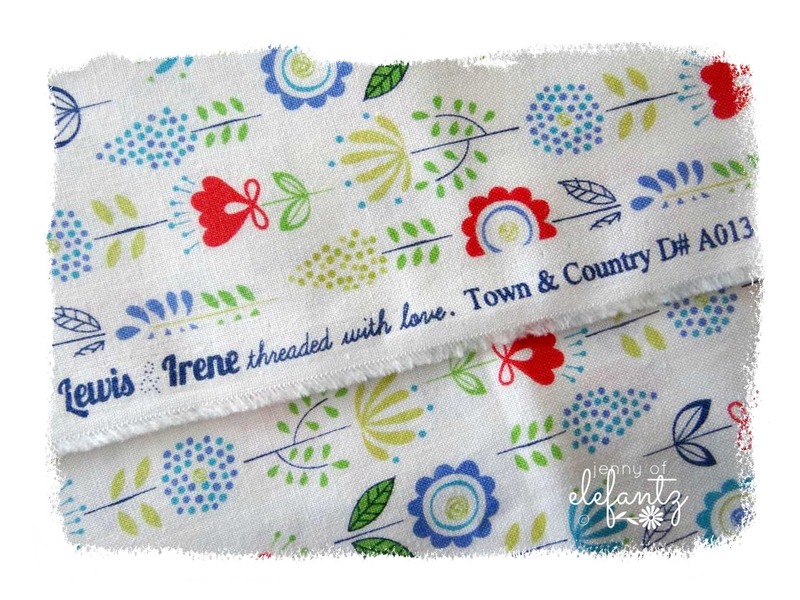 I have been thinking about adding some fabric additions to some tea towels that I have though...so maybe today while a friend is over we will take time and do that also. 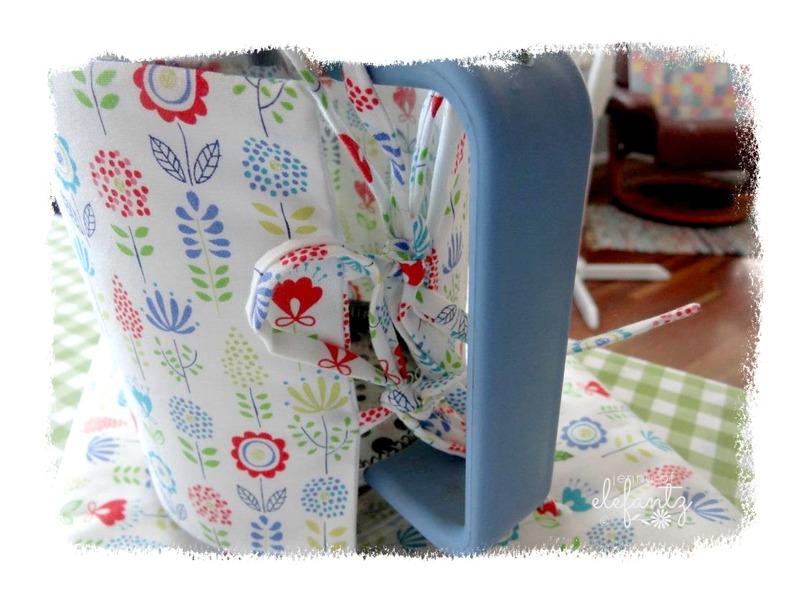 Thanks for sharing your adorable cute fabric, project that you created and inspiration. Have a fantastic creative day! Morning Jenny, A sweet jacket for the Press. Is that coffee or tea. Never heard of a press. Like the idea of the little additions you're thinking of too. I have never made anything for my kitchen, you have me thinking tea towels. Happy to hear your health is on the upswing. I love the idea of a theme fabric for the kitchen. How serendipitous that you bought so much! I have made not one thing for kitchen or table. No updates around here. I just keep using what I already have. Eventually, a friend will send me a new potholder. Actually, last week, 3 new towels to button around the oven door handle arrived, so I guess that was something new! I love the half towel with the crocheted top that I can fasten to the oven for a quick hand drying. Jenny, this is just too cute! That is very happy fabric and it is easy to see why you couldn't part with it. A blue French Press looks lovely with its new fabric wrap. Blossom will smile each and every time she sets her eyes on it. Some additional pieces from that happy fabric will be wonderful to add to Blossom's kitchen. I recently sewed Somme easy table mats that make me happy when I see them...kind of like placemmats but for accessories as well. Love the fabric you used on your press and really brightens up an area. Makes me think of spring and new beginnings. I think your idea of mug rugs to accompany the press cover would make a delightful addition. Blossom is lucky to have such a creative and clever mom as you. You've given me an idea to dress up my tea press. Following your journey through gentle domesticity, really has given me food for thought and we've started making changes in our own home to make life a little simpler and less cluttered. Thank you for all of your creativity, the patterns and for being so down to earth. I would gladly share a cuppa with you any day. God bless you dear lady for your generosity. Beautiful Jenny. So simply and so pretty! Best thing I have made lately is a clear front zipper pouch which holds all my gadget cords. Know where they are and can see them easily. Super!